A cavalcade of star voices combines to bring life to a circus of singing, dream seeking animals in this latest animation from Illumination. Does it hit the high notes of animated wonder though or does it fall flat like a nervous X Factor contestant audition piece? Buster Moon (Matthew McConaughey) is in trouble. His high hopes for bringing theatre to the masses is falling flat. The bank is on the phone, other animals are banging on the door demanding to be paid and this plucky, smooth talking koala needs a plan and quick! He quickly devises a singing competition with a token prize amount but due to an admin error putting the prize up substantially the interest grows and animals from all around come to audition. There’s much to praise about Sing. Likeable characters, great songs and some genuinely funny moments. One particular highlight being a snail singing ‘Ride Like the Wind’. However, a week after seeing this film I’m struggling to remember major moments from it. My kids on the other hand are still raving about it and looking for a return cinema trip already!! To be clear Sing is not bad and, in comparison to some animations (I’ve seen Ice Age 5) everything makes sense, was well written and has a message but it just fades from memory quickly. Taron Egerton as Johnny the gorilla made the most impact, attempting to escape his criminal gang family he genuinely tugged at my heart strings and was the one character I really wanted to find success. Which when you write a sentence like that about a cartoon gorilla is an achievement that can’t be overlooked! This a film with characters who dream of escaping their lives. Not in a pure cash grab but in order to better themselves, to do the thing they love. To escape their circumstances or to escape the humdrum of the everyday. If La La Land encourages adults to dream and to support the dreamers around them; Sing may do the same for kids the trouble is they may not remember a week later. Christian Wolff (Ben Affleck) is a mathematics savant with more affinity for numbers than people due to his high functioning autism. Using a small-town accounting office as a cover, he makes his living as a freelance accountant for dangerous criminal organisations. With a Treasury agent (J.K. Simmons) hot on his heels, Christian takes on a state-of-the-art robotics company as a legitimate client. As Wolff gets closer to the truth about a discrepancy that involves millions of dollars, the body count starts to rise. The Accountant must surely be one of the years dullest movie titles? It would be too lazy and frankly easy to say the film matches the title for excitement levels but sadly that is the case. The Accountant is many things and therein lies the problem. It is could be considered a low budget Bourne and or Bond caper. It could label itself as a tale of espionage and black market arms trading. Or it could be a family drama. Any and all of these descriptions are valid and all of their various, unnecessarily complicated, elements are in play. Yet none of these receive the films full attention and that is the major problem with this forgettable yet fairly entertaining tale. Affleck is in good form as the deadpan Accountant with the deadly skills. His high functioning autism, which fuels his spreadsheet shredding mind sadly gets lost in the brawl for attention of action versus back story. This was the most interesting element for me and I would have been quite happy for the focus to remain there. Sadly indecision took control and an opportunity was missed. So badly handled was this element that at times Wolff's autistic traits are almost played for laughs which I found a little distasteful. I'm sure that was not the intention but certainly his lack of social skills and understanding of nuance in conversation with other characters garnered hearty laughs in the screening I attended and I was very uncomfortable with that. All other major players are forgettable and Anna Kendrick spends the film wandering through with a bewildered look on her face even when dodging bullets. At one point a cry of 'What is going on' from John Lithgow's villainous CEO raised a chuckle in me as I was reassured I wasn't the only one struggling with the details. Even J K Simmons seems to be sleep walking his way through this lack lustre thriller and no individual involved every really appears to be in top gear at any point. There are some enjoyable moments within the film and action sequences are well handled but these will be forgotten easily by the time you leave the screening. he Accountant is not a thriller on the simple basis that no thrills exist within. My favourite moment was watching Affleck whizz through spreadsheets of figures while classical music played to highlight his intelligence. No film should ever have swirling spreadsheets as a selling point! The Accoutant is not as dull a film as the title suggests however it is not unfair to say that a better title may have been The Pedestrian. The Accountant is in cinemas from 4 November. Thanks to Movie House for screening access. Based on the extraordinary true story of Operation Anthropoid, the WWII mission to assassinate SS General Reinhard Heydrich, the main architect behind the Final Solution and the Reich's third in command after Hitler and Himmler.This was not a story from WWII that I was familiar with at all before seeing this film. Josef Gabcik (Cillian Murphy) and Jan Kubis (Jamie Dornan) are agents tasked with this assanination and after a short title card history lesson, we meet the pair moments after they touch down in Prague having been parachuted in. The pair, after several meetings with the Czech resistance, make their plans to assassinate Heydrich but after a failed attempt things spiral out of control. To be honest I didn't know this story at all and given its significance I did feel a certain amount of embarrassment at that on leaving the screening. This is a tale of war where there are no real heroes but simply soldiers living with the consequences of their orders. Both Murphy and Dornan play their parts well and are a decent on screen pairing. As Gabcik Cillian Murphy excels in acting with little emotion highlighting his characters ability to remain detached from events. Kubis however is played with much more emotion by Dornan hands shaking with fear with fear when under pressure and near panic attacks are fought back when he is asked to fulfil his orders. On the negative side I did feel that Anthropoid took a little while to get going and the pairs relationships with their respective love interests were a little tedious at times. However the final act of the film is where the action really takes off. he films final movement (A shoot out/stand off taking place in a church) is an incredibly tense affair and one of the best sequences of this type in recent memory. For those familiar with the story the ending will of course already be known, but it is a credit to all involved that the tension is still palpable and well executed. Anthropoid is a films that takes true events and tells a story that more need to be more widely known. The story is still part of Czech folklore and these men are viewed as heroes for their efforts. Plaques remain to mark their bravery and it is great to see this story told with great heart cinematically. 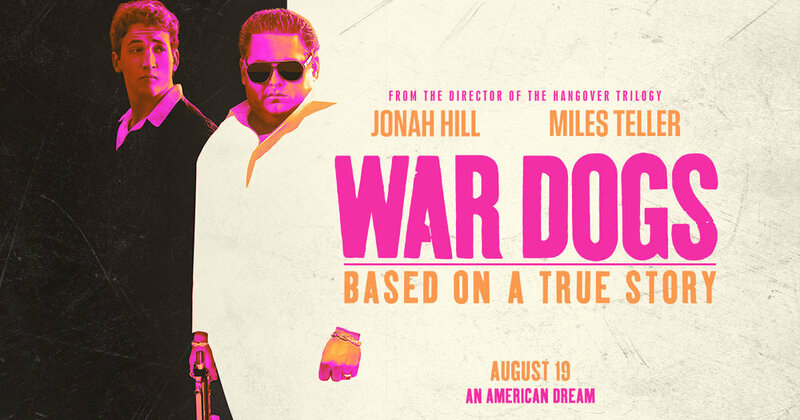 War Dogs is based the true story of David Packouz (Miles Teller) and Efraim Diveroli (Jonah Hill) who by selling arms to the American government may their fortune through an 'any means necessary' approach to business. For his last few films Todd Phillips has disgusted us with Hangover sequels. Tales of debauched characters with little/no redeeming qualities have been his forte. This film is no different. Jonah Hill as Diveroli is particularly vile. His win at all costs attitude and careless disregard for business morals consistently grated on me. This Scarface wannabe has misunderstood the American dream to be a game of win at all costs, make as much money as possible and step on as many people as possible on the way up. As hateful as the characters and their motives are, even more despicable are the films intentions. Initially I thought the film had promise as early on we are quoted shocking figures on the amount spent per soldier in order to kit them out for war. A comment on modern warfare being a profit first venture gave me a glimmer of hope that was going to be a very different film. However the true nature of the piece was soon quickly identified as the film descended into a glorification of gun culture, profit over conscience and no consideration given for the true cost of conflict. Incidentally this film is being portrayed, through it's advertising, as a comedy. I feel this is a huge mis-representation. I found there to be nothing to laugh at. I couldn't get away from these gun toting, joint smoking, bigoted, misogynistic opportunists quick enough. I understand that they are supposed to be portrayed in the manner, but as I sat in the screening I began to reflect on the many similar characters I have witnessed over time on screen and still enjoyed. I thought of Goodfellas and The Wolf of Wall Street and I wrestled with why I enjoyed those films. They had very similar notions and portrayed bad guys brilliantly but I came away from those having enjoyed the respective films. So why could I not enjoy this film? I came to the conclusion that, while both of the aforementioned films portray bad guys whose motives are questionable, they at least display some glimpses of humanity. Even amidst their numerous flaws,they brought you far enough into their worlds that you found yourself caring for their characters. Packouz and Diveroli have no likeable qualities. Even though Packouz has a wife and child you never feel he truly cares for them. Their primary concern is money and not being seen to be a 'loser'. Even in the final act I was disappointed that nether character had a moment of clarity and turned things around. Until the very last frame of this film the pursuit of happiness for these guys can only be found in the pursuit of the almighty dollar. Many have said that War Dogs has allowed Todd Phillips to move to a more serious type of film making with this venture. His days of repulsing an audience are over he has become a 'serious film maker'. I would argue that War Dogs has only served to continue his litany of vile creations. War Dogs is in cinemas from 26 August in the UK. Thanks to MovieHoue for screening access.